Please feel free to shop for your fabric and supplies prior to the first session of class ORyou can wait and purchase them before the second session of class. You will NOTneed your sewing machine at the first class, DObring your fabric IFyou have already purchased it, also if you have questions about the fabric and/or supplies we'll discuss these during the first session. This is a six-session class (a total of 18 hours) and will cover a lot of information and give you a great start toward quilting. The techniques learned on the project will include seven different blocks, borders, creating the quilt 'sandwich', batting, backing, information on simple quilting, continuous binding, hanging sleeve, and a personalized label. 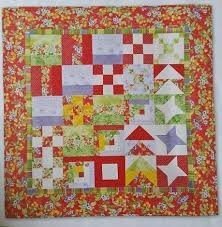 The quilt blocks created will be: Rail Fence, Nine Patch, Nine Patch Variation, Friendship Star, Flying Geese, Square Dance, and Log Cabin. NOTE: You are given the option of designing your own quilt top using the blocks we'll be learning in class. Many students find they like to use only three fabrics rather than the nine to twelve fabrics used in the sampler quilt in the book. The fabric requirements for the sampler and the three fabric quilt are indicated below, if you plan to enlarge your project from the finished sample size (40" x 40") you'll need to increase the fabric requirements accordingly. My fabric requirements have a SMALLamount extra included to accommodate the need to recut strips if necessary. Some students have made table runners or placemats rather than a ‘quilt’ this is your decision – PLEASEmake this YOURproject. Note: This third color is often a neutral. NOTE: If directional print you'll need 2 Yards. NOTE: If you are planning to quilt your project yourself the above backing amounts will work BUTif you are going to use a Long Arm Quilter you’ll need additional fabric in order to have at least 5” of additional fabric on all four sides from the project. If your project finishes at 40” x 40” you’ll need 50” x 50” of backing fabric and batting. unsure about as we’ll discuss pros and cons of the items listed. NOTE: The cutting mat is for your use at home - not needed in class. A Wooden Iron or Bone Folder will also work. NOTE: These items, except the backing and batting are ONLYneeded if you intend to quilt your project yourself. If you plan to have a long-arm quilter finish your quilt you will only need the backing fabric and batting. Also, most long-arm quilters need the backing ANDbatting to be at least 8" to 10" longer and wider than the project top so it can be loaded onto their frame for quilting.